At the beginning of the twentieth century, labor leaders in women’s unions routinely chastised their members for their ceaseless pursuit of fashion, avid reading of dime novels, and “affected” ways, including aristocratic airs and accents. Indeed, working women in America were eagerly participating in the burgeoning consumer culture available to them. While the leading activists, organizers, and radicals feared that consumerist tendencies made working women seem frivolous and dissuaded them from political action, these women, in fact, went on strike in very large numbers during the period, proving themselves to be politically active, astute, and effective. 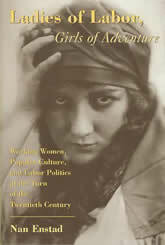 Examining material ranging from early dime novels about ordinary women who inherit wealth or marry millionaires, to inexpensive, ready-to-wear clothing that allowed them to both deny and resist mistreatment in the workplace, Enstad analyzes how working women wove popular narratives and fashions into their developing sense of themselves as “ladies.” She then provides a detailed examination of how this notion of “ladyhood” affected the great New York shirtwaist strike of 1909-1910. From the women’s grievances, to the walkout of over 20,000 workers, to their style of picketing, Enstad shows how consumer culture was a central theme in this key event of labor strife. Finally, Enstad turns to the motion picture genre of female adventure serials, popular after 1912, which imbued “ladyhood” with heroines’ strength, independence, and daring.